Vancouver citizens are being stymied when they try to use more energy-efficient transport like small motorbikes and scooters. There is very little, if any, safe parking in Vancouver for small motor vehicles in this class. 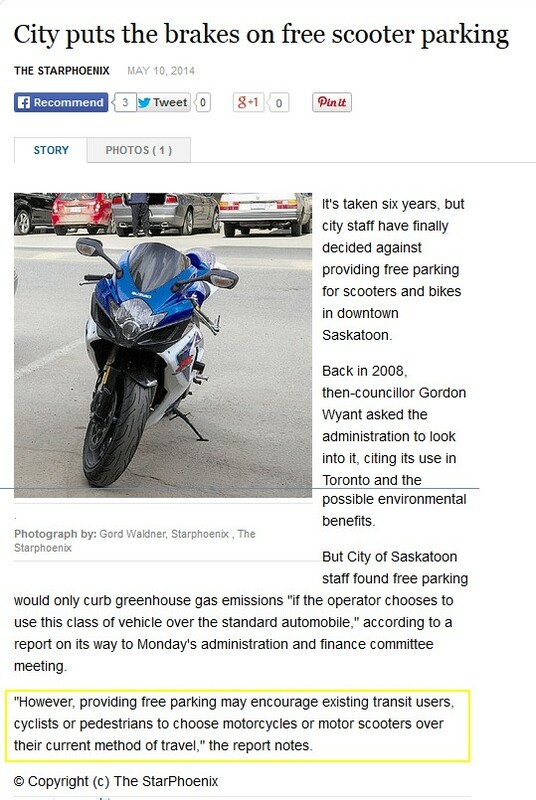 Municipal politicians are unaware of the "green" advantage with motorized two wheelers, so it's most important that City Council hears from you. Otherwise they think that your motorcycles are no big deal, i.e. unimportant. Generally speaking, community leaders are sympathetic to "greener" forms of commuter transport. However many are limited by the belief that "green" only means riding a bicycle, taking transit, or walking; and that "greener" commuting means e-bicycles and electric cars. You'd think they'd make room for green motorcycles; however the result of this disconnect is that parking while expensive for large SUVs, is even more expensive, scarce, and even dangerous for motorcycles. As a result, after crunching the numbers, commuters conclude that it makes sense to buy bigger, faster, more powerful SUVs - not green 2-wheelers. In many cities across Canada, local transit officials try to discourage the use of motorcycles since they feel that each motorcycle rider is one less fee-paying transit rider. Transit is expensive and every possible paying passenger must be scraped up and jammed into the buses. Local councils are encouraged by transit planners to eliminate free parking for motorcycles in order to force 2-wheelers onto transit. Today's reality is that electric cars are manufactured as compliance vehicles to comply with the California Air Resources Board requirements. Electric cars are still mostly expensive playthings for the wealthy. Why Don't Commuters Ride More Bicycles? Bicycles are delightful on a sunny day, but hazardous and slow for commuting. Ridiculous helmet laws discourage widespread cycling, and bicycle lanes on major roads are frightening to use for some bicycle commuters. Aren't Motorcycles Heavy & Noisy? The cheapest, quickest, and greenest transport available to urban commuters is the smaller 50cc - 125cc motorcycle or moped scooter. Most small motorcycles are as close to non-polluting as a motor vehicle can be. But the motorcycle suffers immense bureaucratic discrimination! Rules and regulations in BC cause even the smallest motorbikes to be lumped in with trucks and cars - all are classed as "motor vehicles". Thus, motorcycles must park in regulation parking places, just like a car, with the wheels parallel to the curb. Motorcycles must pay full-size parking rates(except when using pay-by-phone). Small motorcycles & scooters (which are easy to steal) can't be locked to bike racks, even though that's the most secure way to park. Didn't Vancouver Create Special Motorcycle Parking Meters? The City of Vancouver has tried to accommodate motorcycles with special parking meters, but the result so far is a little confusing. One meter is supposed to serve 3 or 6 motorcycles. Nobody knows how to use the meters - so the spaces are often ignored! As motorcyclists predictably reacted to these so-called "green meters", the City of Vancouver came down on motor-cyclists with the heavy hand of enforcement, trying to force 2-wheelers into compliance. It hasn't worked. Commuter scooter and motorcycle riders have reverted to trying to find little nooks and crannies to stash their machines. What Happened to "Green" Commuting? Paradoxically, cars are getting bigger & faster while bicycle commuters are terrorized by high-speed traffic, and would-be motorcycle drivers are being discouraged by the City bylaws and by BC motor-vehicle laws. Surprisingly, the only body trying to encourage green transport in BC is ICBC. Insurance rates favour small, low-powered motorcycles. However, both the City and Province, with their rules of the road and bylaws, to a degree still discourage motorcycle commuting. Traffic engineers have demonstrated that even a 10% mix of scooters dramatically reduces commuting pollution. Everyone benefits when motorcycles are encouraged.